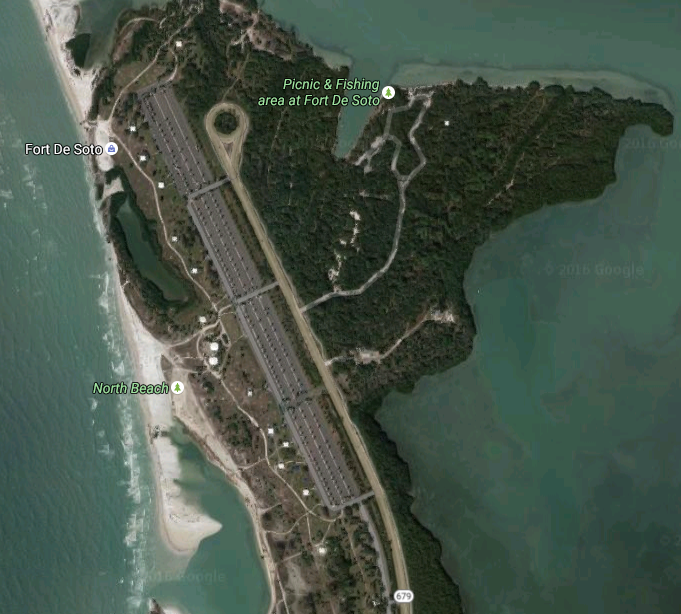 Aerial view of Fort DeSoto Park. 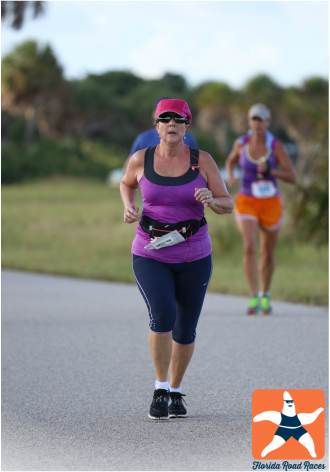 Ft DeSoto's 15k was on paved trails. 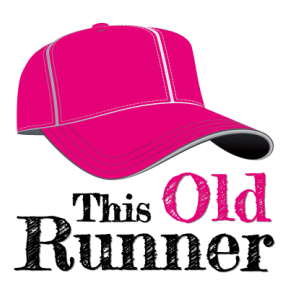 Local Race Directors, Chris and Rya Lauber of Florida Road Races added a new event to their season in October 2015: the Fort DeSoto 15K & 5K. I think this race is a nice addition. It gives runners a chance to test their fitness after the long hot summer — but before the half marathon season begins. You can easily incorporate the race into your training plan. The races take place completely inside a beautiful Pinellas County park, just south of St. Petersburg in Tierra Verde, FL. Packet Pickup: Yes. Several local pickup options at Fit2Run stores in Tampa and St. Petersburg. No expo. Packet pickup also available on race morning. Race Course: The race is on paved trails and roads. You won't be running in the sand. It's a flat USTAF certified course. The course starts in the parking lot, then follows the paved trails out and back. You see most of the park and run next to Tampa Bay with a view of the Skyway Bridge. Lots of birds and foliage. Pacers: No. I secretly chose a couple of my fellow runners to be my pacers. Walkers are welcome. No early start for walkers since entire race is inside the park. Support on course is based on 17 minute pace. All athletes start at the same time. Aid Stations: Yes. Six stations for the 15K. One for the 5K. Include water, Gatorade, and fresh orange slices midway through 15K race. Volunteers all very cheerful, attentive and encouraging. Parking: Easy and free. Read and follow the directions you receive prior to the race. Arrive early on race day for the best spot, but don't worry, there is plenty of parking. Park Entry Fee: The Race Directors PREPAY the entry fee to the park. ($5 value). Do NOT stop to pay at the toll booth at the park entrance. It will cause a traffic jam. Usually, someone is in the booth to wave you through. If you're super early, just know that your entry fee is already paid. Florida Road Races offers full refunds when you register early. This is a nice feature you don't see often. Check the website for details. 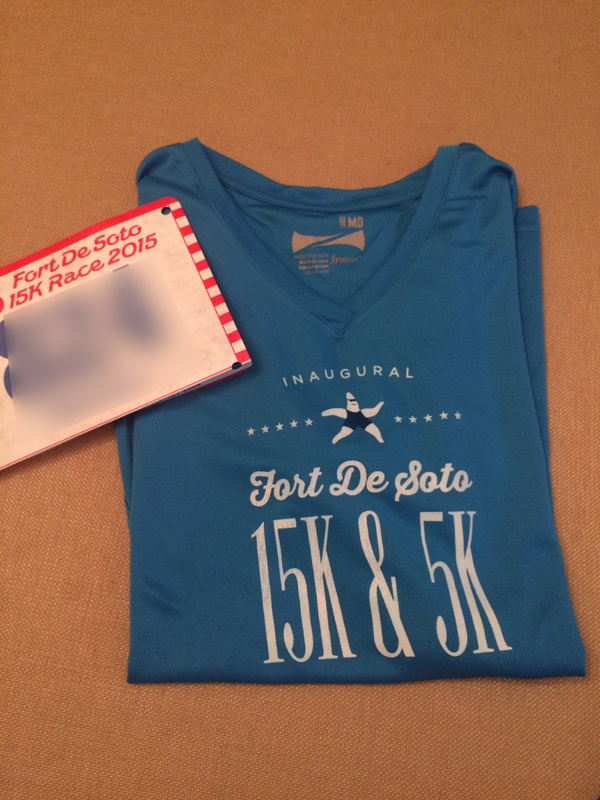 SWAG (Stuff we all get): Short sleeve tech race shirt and bib with timing chip attached. Personalized bibs are available for early registrars. Post race party with live music and good food. 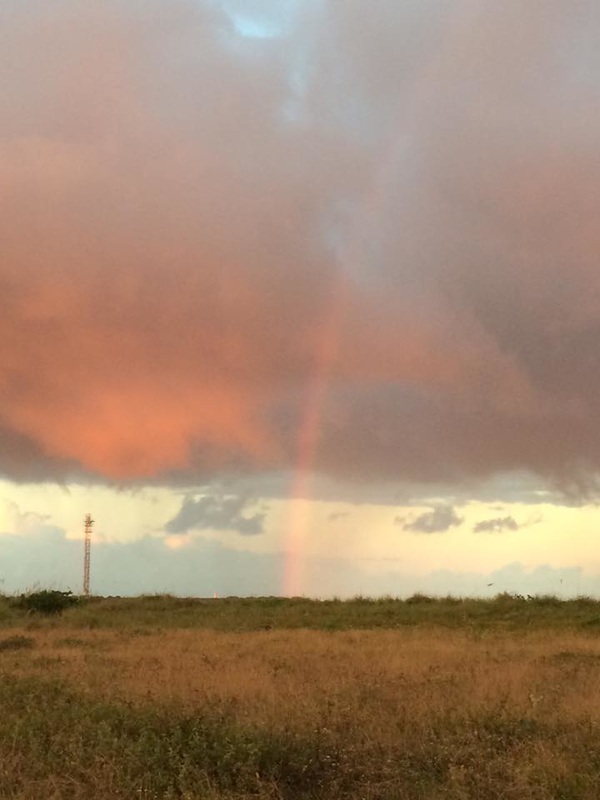 Happy Surprise: As the sun rose we saw a beautiful rainbow. Unhappy Surprise: Heavy rain early in the race. Post Race Festivities: Florida Road Races does a great job staging their races here. The finish line is in the sunny parking lot, but the beer, food and awards ceremony are under the shade of mature oak trees. You'll be shaded as you grab a beer, water, chocolate milk, and some food. Food includes fruit, pastries and pasta. Pull up a chair, or find a seat in the grass. Live music. North Beach is a few yards away. Photos: Yes. FREE race photos. The photos were online in three days. Runners receive an email with a link for free downloads. Awards: All finishers earn a large starfish medal. Awards given 3 deep for Male and Female Open, Masters (40+) and Grand Masters (50+); Age Group awards are three deep in 5 year increments. Timing Chip: Yes. The chip is on your race bib. Weather Report: Early October in Florida can be hot. It was 75º at 5:30 am. -> Light rain at the starting line. -> Heavy rain downpour early in the race. -> Temps were mid to high 70s throughout. Extras: Fort DeSoto Beach was named America's #1 beach by Dr. Stephen P. Leatherman, a.k.a. Dr. Beach. The park is a beautiful, natural setting. Plan to lounge on the beach or visit the historic fort after your race. There are plenty of picnic shelters, plus a bait shop, gift store and fishing pier. The 9.3 mile race is an out and back course. You can see plenty of parking from the sky. After the rain there was a beautiful rainbow. All runners received a blue short sleeve tech shirt. 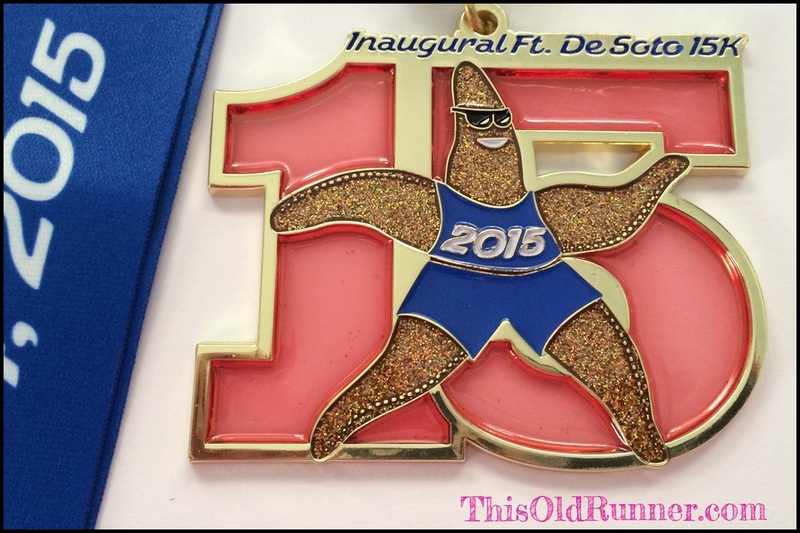 The 15K medal had a translucent red 15 behind the iconic starfish logo. A nice addition to the medal collection. 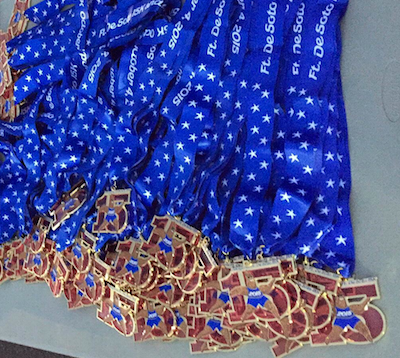 Complete a 3-race series at Fort DeSoto, in any combination of distances to earn the Triple Crown medal. You save money by signing up for the entire series. Soaking wet and wearing the wrong socks, but getting it done in the 15K. I left the house about 5:40 am and traveled easily to Fort DeSoto. 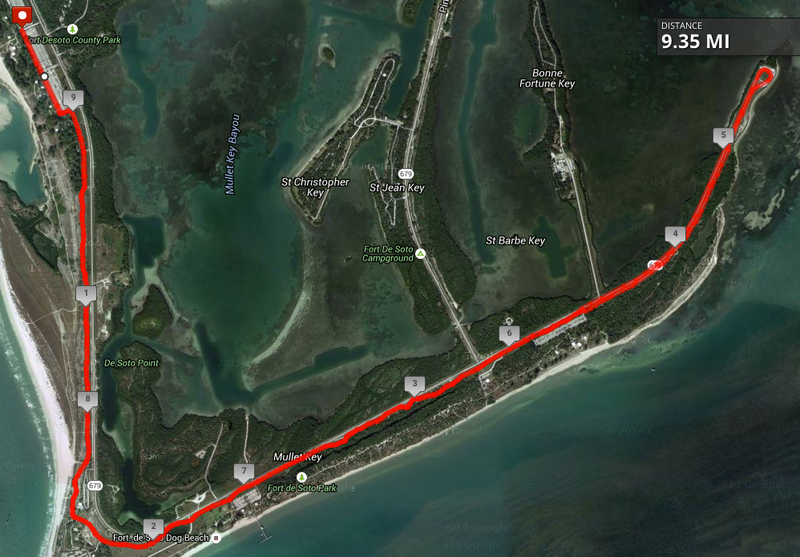 Took I-275 to 54th Ave. South to the Pinellas Bayway South (75c toll) to Fort DeSoto. FREE admission to Fort DeSoto Park (usually $5 fee). Race Directors prepay entry fee for all runners. While we awaited the start of the race there was a light sprinkling of rain, followed by a major downpour early in the race. Read the full ﻿race recap here﻿.